In the modern Western world that stresses the importance of being yourself and of keeping it real at all possible times, anything that strays from the mantra of authenticity, such as pretense and artifice is frowned upon and discouraged. 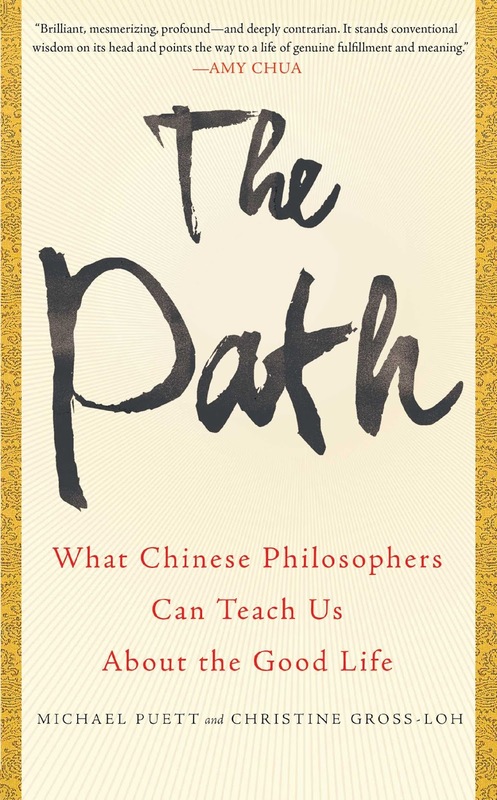 So the title of my review may sound rather critical and you may be awaiting a scathing and blistering attack on the book in question - The Path: What Chinese Philosophers Can Teach Us About the Good Life by Michael Puett and Christine Gross-Loh – but, in fact, it is quite the opposite. Before I talk about the art of artifice, let us first take a closer look at a few concepts that we all claim to know and take for granted, such as being yourself. I have always wondered about this piece of advice given to people who feel distressed or confused in their lives and they are told just be themselves as if it would solve the issues at hand. This panacean reply is just as confusing as anything else one could say to a suffering person. How can I be anyone but myself since I cannot be you? And more importantly, how do I know who I really am when I find myself acting and reacting differently in different kinds of social situations? And which one of my potential selves is the right one and how can I be certain that this is indeed the right and most genuine version of myself? The Path claims that most of what we see as ourselves is essentially and merely a series of patterned habits. I see myself responding in a certain way to a given situation over time and I assume that this is the most authentic response. It seems that being myself would be to act as naturally as I can; in other words, to act out what seems to me the most honest response at that moment. But is that really the best method? If I feel angry, should I vent it and perhaps throw a book (maybe even this one) in the direction of the person causing my fit of anger? Should I be blatantly and unabashedly honest with my friends and with my colleagues and superiors at work and give them all a piece of my authentic mind? Would that be the golden rule to follow? The answer according to main Chinese philosophers, including Confucius and Laozi would be a simple no. Your fluctuating emotions and your patterned but limited perception of yourself is neither good for you nor for your surrounding and may not after all, be who you truly are. Yet one thing is for sure, that living on a steady whim and acting out your moment-to-moment desires cannot be constituting who you are. Or else we ought to be judging a toddler child not by their merits but by their tantrums. So the first solution here before being yourself is to “get a grip on yourself.” We need to be aware of our seething and random emotions (qing) and also learn to control them (yi). Now this does not need to be undertaken in a dictatorial way in which we kill off any potential vitality with the cold iron-blade of reason and logic. This simply means to be the proverbial captain of the ship and not be thrown hither and thither by the winds of emotion but to steer them in the desired and most beneficial direction. While doing so, a little bit of artifice (wei) may not be detrimental. Since you are refining yourself and your responses and interactions with the world, it would not be the worst to tame those wild feelings and passions of yours. Say, you literally feel passionate about an unknown person you have just had the pleasure to meet, and if you jump on them and cover them with wild kisses, most likely you will be seen as demented and may even be taken away in a straight-jacket to be forcefully re(de)fined. In that situation, artifice would definitely come in handy. You can learn about how to flirt, read and memorize inside out the helpful and useful lines of Ovid’s Art of Love and use them to your own benefit. By restraining your passion for the moment, once the right occasion appears you can then unleash that part of your self for the benefit of you AND your chosen partner. Both Laozi and Confucius would agree with those situations. The first one says that we need to be in the zone when it comes to acting out and hence living out the DAO, that is, we need to train the mind to become spontaneous. Now this may seem an oxymoron, but a spontaneous response ought not to be random but should be the one coming from the heart-mind (xin). In fact, in this way you can calmly and carefully select the most appropriate and most genuine response among all the ones that pop up in your mind instead of wholeheartedly giving in to the first erratic impulses that arise. Of course, this involves a certain amount of training and discipline and cannot happen overnight. By learning to calm the waves, you gain the power to be as authentic as you wish. The book gives the example of cultivating a hobby or sport. At first, you may be overwhelmed with all the new concepts or movements, but once you get the hang of it, you will be better at the given activity. That is when you can hone and refine your skills and will experience that wonderful moment of being in the zone, in which you instinctively know and respond to the situation. That is the natural state or the Way (Dao) and it takes practice and artifice to get to it. The other undoubted benefit of being in the zone is related to the enjoyment of the given activity and by expansion the joy for life in general. The Path makes an interesting observation of how we use an activity, be it yoga or soccer to escape the mundane and the dreary aspects of day to day life. But that is only temporary bliss, as we will find ourselves again in the midst of stress and boredom. The trick is to manage to be in the zone or have “flow” constantly, just as the samurai has awareness of his surroundings at all times. The benefit of such focus would be to feel vitality and not be dragged down by depressing or destructive and harmful thoughts about ourselves or life in general. We would enjoy whatever activity we undertake and not see a significant difference between doing the dishes and playing soccer. The activity will then turn (ideally speaking of course) from a chore to one of joy and, in the meantime, time will pass quickly. Those kinds of activities may become rare with adulthood, but we see them often in children. They are at times so absorbed in what they are doing that they cannot hear us or seem to exist on a different plane of existence altogether. This is the purest form of DAO one can imagine and it is indeed something that comes naturally to us at first especially during childhood, but we seem to lose contact and connection with it over the years. The second philosopher I want to discuss here is Confucius. The authors start off with the warning that we often misunderstand and misrepresent this great philosopher in our Western mind. We often rely on stereotypical thinking that is mainly transmitted to us from the idealistic and romantic 19th century. Confucius is often represented as striving for social harmony at the expense of individuality, that one ought to sacrifice one’s own ambitions and reign one’s desires for the common good. Now this is partially true, but there are deeper aspects and facets of his philosophy that many do not know about. Enter the art of pretense. Even as an infant, we enjoy games of pretense. That is the basic premise of the joy behind peekaboo. The infant is presented with the possibility of disappearance of the adult only to face the immediate appearance. There may be an element of surprise here, but the infant does not take the whole situation at face value. I believe that the infant already knows this to be a game and hence does not feel threat or anxiety at the so-called albeit momentary disappearance of the parent. The movie The Witch demonstrates how such an innocent game could go horribly wrong, but that is another matter indeed. The same can be applied to the popular game of hide-and-seek. This is where we simulate our disappearance, but do not stretch this far enough to become troubling. If we cannot find the child (again see The Witch) or if the child has trouble locating us, this game could easily turn into one of anguish and suffering. Hence, as a parent, more often than not, we let the child win and give away clues of our whereabouts, a foot sticking out or an intentional cough. This game occurs on the level of pretense. We pretend to be lost and are then subsequently found. Both we and the child know this not to be a fact and it helps us to not only connect with each other in terms of an age-appropriate active game, but it also puts us on the same level or social standing. The parent temporarily suspends his role of the educator / enforcer and becomes a rather foolish counterpart to the child who assumes to be more competent and adept at this game. The child may or may not know that the reason they win this game is because the parent lets them. Yet either way, we are then reacting to our children less as a parental figure but more as a playmate. The book refers to such moments as as-if worlds. It is commonly used in therapy sessions to shed light onto relationship issues. The roles are then reversed. The child is said to play the role of the parent and tell her what he thinks of her, while the parent does the same with the child. In such a way, we may unearth some conflicts and resentments and perhaps even misunderstandings between the two parties. Yet its strongest effect is the fact that we momentarily take on another person’s point of view and understand not only them but perhaps also ourselves a little better in the process. This practice of pretending to be the other person can be expanded and applied to many different areas of one’s life. We can better understand the grumpy co-worker or the angry boss if we imagine and visualize the underlying dynamics of the situation. In fact, visualization, another type of pretense, helps us to improve our own skills. When we imagine ourselves in an activity or a situation, the brain goes through the motions, so-to-speak, and we can perform better in the real-life scenario, be it a presentation, a job interview or an athletic event. In fact, athletes from soccer to hockey players tend to do such visualizations in the comfort of their home and often find themselves more successful on game day. I even give this type of advice to my own students: If you happen not to be a good student, then pretend to be one. What happens is that through rituals, you will gradually become more adept and competent in that endeavor and often, before you know it, you can master it! Rituals are highly encouraged in Confucianism, but in modern life, they are often frowned upon and dismissed as empty or pointless. The reason is that we see most of them as either a form of brainwashing or as a void gesture as they may not correspond with reality, beliefs that can themselves be traced to our Calvinist and Protestant legacies. But in itself, it is not a bad idea to follow certain rituals and practices whether one truly believes in them or not, simply because of all the beneficial effects it has on a personal as well as social level. One example would be Christmas. Many people do not see it as the celebration of the birth of Christ, but rather as a time for festivities. We pretend that Santa exists, not because we enjoy lying to our children, but because it fosters feelings of excitement and joy within them and as a result, within us as well. We also see those times as a perfect opportunity for forgiveness and for healing. So we might pretend for the moment that bygones are indeed bygones. It often works, temporarily. But what if we imagined, and I know this sounds corny and ask for your forgiveness, that every day was indeed Christmas. We might reduce our own conflicts and create more harmony among friends and relatives. We will more easily forgive the grumpy cashier or bus-driver. Or if we can’t actually forgive them, we pretend to do so. What happens is that the pretense becomes real, especially with continued practice. A shy person may pretend to be confident and gradually, he may believe it to be true. Since he is pretending to be confident, he will be able to elicit the responses he is looking for and as a result, people around him may warm up to him. By immersing himself in this practice, he will, lo and behold, become confident, and that shy person may have been who he used to be in the past but does not refer to who he is at this particular moment. And that leads us to the final point I want to embark upon, namely the belief that the world is stable. The Path claims this is not so, and that the perceived stability is merely an illusion. But this illusion can cost us and lead to faulty thinking and behavior, or at least, it may limit our options and possibilities. Let us look at an example. A couple decides that they will get married on a certain day in the future. Now let us hope that this will be so, for their sake. But this assumption is based on a stable and predictable world. I am not saying that it won’t happen, but there are also many influences that could hinder the wedding from occurring ranging from the benign to the grave. It could happen that somehow, for one reason or another, that particular circled day on the calendar may not be possible nor the best option. The assigned marriage commissioner might call in sick last minute leaving little option to get somebody else to replace her. Close relatives may face complications in their travel arrangements and may not make it on that day. Or simply, it may rain, or worse, there may be a hurricane passing through forcing you to postpone the wedding. All of these impediments come from the outside. They might also occur from the inside. You may have major fights and decide to cancel the wedding. You or your partner may get cold feet or may meet somebody else in the meantime. Even worse, one of you may have an accident and die (sorry for the bleak image). My point is that no matter how well-intentioned and structured our plan may be, it can always backfire. And the reason for this lies in the fact that life is indeed not always predictable. Our problem is that we think it is and feel frustration when it ruins our plans. This may not always be for the worst. It might be that not getting married with that person would be a better option for you. Again, somebody else might come along who is more suitable and more compatible with you. By not limiting your options and not stubbornly and blindly adhering to the Plan but rather by going with the flow, we might save ourselves headaches and even find a better path to tread on. In our life, we may feel stuck with one option. We may cling to a particular job because we feel that is the right one for us or that it is the best for our needs. Yet life - or fate / destiny (ming) - may present us with another opportunity that is better suited for our talents. If we do not give the other opportunities a thought and rigidly stick to what we have, we may be missing out. Likewise, what might be initially seen as a personal disaster (job loss or divorce) could lead towards brighter horizons in the future. So I heartily recommend this book. Part of the reason is because I have previously thought about and struggled with those issues myself and that our conclusions are rather similar. Again, I do not fully agree with all the premises and tenets of The Path. I had my reservations at the start, but as I read along, I begin to appreciate it much more and consider it a healthy mix between philosophy and self-help. I do not, however, agree with the view that the world lacks stability or structure, that it is random and chaotic. I think that there is a hidden moral center at work that does punish the evil and reward the good, and that this is not limited to the life we have now, but can be applied to future states of being. The authors seem to contend that the world and our life are unstable, but that we need to cultivate ourselves to respond to this fluctuating world. It seems that any kind of morality would boil down to pretense, imagination or social convention and it is not necessarily seen as a universal law or rather law of the universe. Put differently, the divine comes up a little short, although the utilitarian Mohists with the moral deity Heaven (Tian) align a little closer with my view. Yet, for all intents and purposes, I think this book offers a refreshing look, explanation and most importantly, application of Chinese philosophy to our lives and it may offer relevant and necessary change in our way of thinking and especially living the good life. It also puts some of our given ideas and thoughts about ourselves and the world on its head, and I can only applaud the authors for such an outstanding hand-standing feat. I really appreciate this post, and I am glad to have found it. Yesterday I was so angry. I know that my feelings can be controlling and dictate how I should act. This reminded me of not giving up and give in to negativity. I have always hated hypocrisy and fakeness because I struggled with doing that, but this reminded me that there is worth in looking at it in a different way. Thank you very much for your comment! I believe that both anger and negativity are part of human nature and that they are in themselves not necessarily bad, the yin to the yang, so-to-speak. In fact, I often see anger as a sign that one cares about issues. However, instead of giving in to it or letting it fester or manifesting it in harmful and destructive ways, I believe one should try one's best to do good since many good things can arise out of anger. I also fully agree with you on hypocrisy and phoniness. Unfortunately, they abound in our society and I see that as a sign of insecurity in people.